Bobby socks are a must for any poodle girl or sock hop costume. Popular in the 1950’s these bobby socks will be perfect for completing any costume from that period. Pair them up with one of our poodle skirts and a pair of our saddle shoes for an easy and affordable Halloween costume or for a 1950’s themed dance or school project. These are great for the show "Grease". 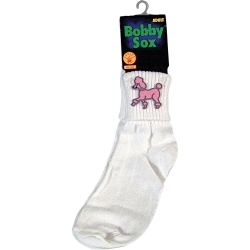 Socks are white with a pink poodle and available in both adult and child size.